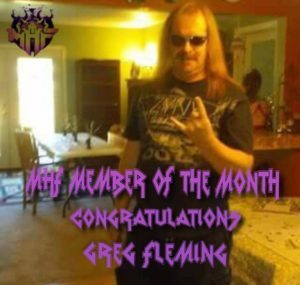 October’s member of the month is Greg Fleming! Greg is 48 years old, and lives in the grunge capital Seattle. His favourite bands are Mötley Crue, Guns’n’Roses, Metal Church, and the entire Seattle music scene. Greg got into metal by listening to AC/DC in the late 70s. The best concert he went to was Mötley Crue’s Shout at the Devil tour with Ozzy in 1983. On behalf of MHF, congratulations! You’re active, and a really nice guy, the perfect guy to be crowned as member of the month!